Try our home office decorating ideas, for a space you will love to work in. My Home Office is Perfect for my New Web Business! Do you want YOUR own business? Want to work from your own home office? Take advantage of the SBI Promotion below. Save on Computers for your business here. Try the 90 day free trial and Start YOUR OWN Business Today! We have recently completed our new home office and I am loving it. I have some unique home office decorating ideas to share with you. You may get some ideas that you had never thought of before. The picture above shows the built in desk and shelves in our new office. These were made out of reclaimed antique KY barnwood. We have used alot of salvage materials in our office. This is a good way to stretch the budget and recycle at the same time. If you are fortunate enough to have your pets in your work area, provide them with a comfortable place to rest. Click on the comfort first link below for full details. The open shelving above the office desk gave me an area to put the printer, computer towers and other necessities. I even have room for some decorative items (dog and cat themed decor) mainly that personalize the home office. All of this added storage area is out of the way of the desk below. The shelves are very sturdy, made from solid white oak barnwood, just like the office desk. We have two identical computers, I can work on my web business while my husband does other things on his computer. With prices on computers lower these days, and them being so necessary in our daily routine it makes more sense to have 2 in our household. If more than one person uses the computer often, no waiting in line to use the equipment, this means less down time, and better production for both parties. We both love to customize furniture pieces, and reuse old items to make them like new again. Like the one we modified for the desk cabinet. I will touch on some of our related projects in better detail on another page. 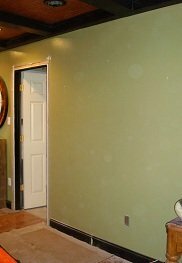 We have been working on a complete basement renovation of our home on and off for a few years. We work on outside projects during warmer months and indoor projects during colder months. So it takes longer to complete a large project like a basement remodel, but it also gives us a change, by working on projects in other locations. Taking your time to complete the projects also gives you time to determine what your real needs are in the space. Our basement remodel has included a new family room , laundry room and home office. We have plans to add a full Handicap accessible bathroom off of the office next. The home office is open to the family room so it feels much larger than it is. See photo below of the wall that used to be between the two rooms. We had actually built that wall 2 years ago, during our first stage of the basement remodel. We determined that it made the family room feel small so we decided to rip it out. It had not been finished in the office side yet. The 2 rooms grow as the wall comes tumbling down! This picture below was taken as the wall was being removed. The opening immediately made the space feel much large in both rooms. The last thing I wanted was a home office that was isolated. I knew I would not use it. The natural light from the office space really helps to lighten the space in the family room too. The office goes from being a 10x11ft space to 10x15 after the wall comes down. The family room furniture was rearranged to face the office. ( It also faces the tv and aquarium niche builtin) and the openness made the family room feel much larger than before. There is a built in niche in the family room wall facing the office, that houses a flat screen tv and built in fish aquarium. We have incorporated lots of builtins to all of the basement areas. More on that topic on my basement remodel page. Our home office has some unique design characteristics. We used chestnut barnwood to make wainscoting on the lower section of the walls. We also made chair rail molding out of chestnut. My new office is GREEN in more ways than just the paint color! We have an abundance of barnwood right now because we have removed some barns. We love the look of the barnwood and are happy to have had an opportunity to use it in our home. We have used alot of barnwood on other outdoor projects too. Checkout our raised bed garden page to see more. We have 2 barnwood beams in the office and crown molding is also made of chestnut. Our built in desk and shelves are made from antique white oak barnwood. We applied 2 coats of poly on the desk and shelves. That darkened the wood to a beautiful dark brown color. We topped the desk with a piece of 1/4 glass cut to the size of the desk. The result is a very sturdy, functional custom desk that looks great and is made out of recycled materials. We have a recycled antique cabinet under the center of the desk area that used to have legs. We completely modified the piece and removed the legs. Then we surrounded it in chestnut of both sides and painted and antiqued the front of the cabinet. We have another antique cabinet that is painted and antiqued to match. The colors of the walls and these cabinets is slate green, semi gloss. The cabinet drawer fronts are black, antiqued in slate green. The painted trim in the office is black. We continued the black and gunstock stain color from the family room area. The family room also has 2 walls painted slate green. The office has the same ceramic floor tile that is installed in the laundry room. Canyon Slate is the color. 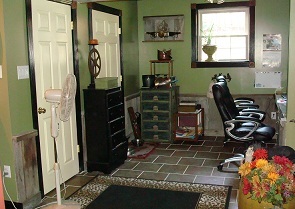 The ceramic tile picks up the slate green, brick and cattail paint colors used through the basement. The entire basement has black fluted trim with gunstock rosettes as accents. The family room was the first room completed in the basement and we decided to carry out the same family of colors through the space for a better flow. The result is a dramatic look that is very interesting. We spared no details in all three of the adjoining rooms. 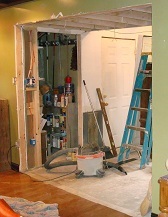 I will give more details on the entire basement remodel on another page. Make your new home office open an airy. So you don't feel to isolated and away from the rest of the house. If you have small children, a design like we have would be perfect. Because you could work in the home office and still be able to see what is going on in the family room. You could still communicate feeling between the two spaces. If you have a basement, use it, our office is on the lower level and with it's completion off of our family room we are now downstairs all day long. It saves alot of wear on the main floor of the house. We have pets, since we are downstairs more now, the pets are too. Again this keeps the main floor cleaner. It is best to separate the areas like this. You still get up, and go to work, (downstairs) even though it is in the house. The focus is better when you don't have distractions from other areas of the house. I notice that we are using our backdoor, through our garage for exiting the house to the backyard more. This keeps shoes from collecting upstairs. Overall the results are very appealing to us. I think you would see the same result. We have moved our coffee maker to the laundry room,(which has a sink cabinets and counter top area). That means less mess in our kitchen upstairs. The laundry room adjoins the home office so they are just steps apart. That means less trips up the stairs. Surround yourself with things you love, photos, of family or friends or your pets. We have alot of pet themed items in our office and family room. And of course our pets are in here most of the time. They can be great stress relievers! Something inspirational and motivating is also good for your work environment. I have a barnwood sign that I painted a when I left my job "Self Employment is Self Empowering". I hung over a door in my office. I see it when I turn around. I find it comforting. Have comfortable furnishings in your office. We bought 2 new office chairs that are identical. They look nice and are very comfortable. I spend alot of time on the new office working on my web business. I feel I deserve to be comfortable while working. I am sure you do too. Check out the link below for a great selection of coffee products at wholesale prices. If you work from home this is a wonderful offer and another way to save money. See my pet photos, I have the privilage of working in my new home office surrounded my by wonderful furballs each day! Our cats are now feed in the laundry room too. That means less mess in the kitchen area and less clutter. Having a home office has cleaned up alot of clutter that comes from daily mail too. No more mail goes upstairs now. That in iself in worth a fortune! Cleaning up upstairs is a breeze without the clutter. Below is a photo of our home office. The view is from our family room looking in the office. The two rooms flow together very well with the color scheme and the openness of the floorplan. Get YOUR Home Office Organized, check out the link below for great products for your office! Do you have a great story about this? Share it! 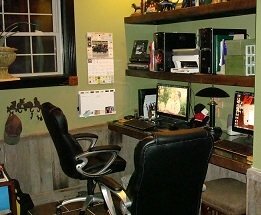 Do you have a great home office that your built yourself? Have you included GREEN products in your office? Tell us about it! You can do it too! Start a Home based Business like I have, work from YOUR Home Office, like I do, and have time to enjoy life! Click on the link below to find out how you can have a web business with SBI. I am sure glad I did. I make my own schedule, work out of my home office, and love the freedom I have now! Check out the link I just found below, for a Nook Ebook Reader. It is from Barnes and Noble. With the Nook ebook reader you could even read outdoors or when you travel. Nook seems like a great idea for work from home professionals to me. No more being forced to read an ebook from your computer! Then below the Nook link is another link for ebooks from Barnes and Noble, Check it out the selection is huge. There are some home improvement ebooks available there. Looking for GREEN products for some of your home and garden improvements? Click on the link below for a good online supplier.